The building is an innovative project that requires a lot of time and energy. OSBlock offers you the simplicity as soon as the first shovelful of earth. You can now rise to the challenge and build your house to save on the cost of materials, the time of man or to oversee the process from A to Z.
OSBLOCK redefines traditional building techniques by offering a modular and structural product that allows for quick and easy wall installation while exceeding current energy efficiency and durability standards. 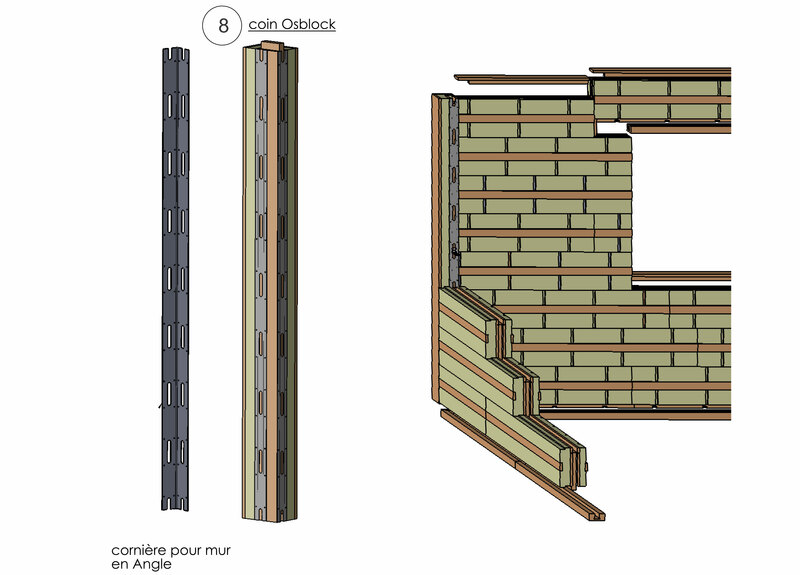 OSBLOCK consists of four layers of Oriented Stand Board (OSB) cut into 12 inch (30.5 cm.) wide strips by 8 feet (244 cm.) long. These four panels are laminated and assembled to form the structural core of the block. Slightly offset downwards, the two sections of the center will fit into the top section (or the starting rail (7)) of the bottom block. Each block has five anchor points that serve to lock the top piece to the bottom piece by means of strong polymer locks (5). Finally, a 2 1/2 inch (6.35 cm.) shim is bonded to the polystyrene surface and nailed to facilitate installation of interior and exterior liners. 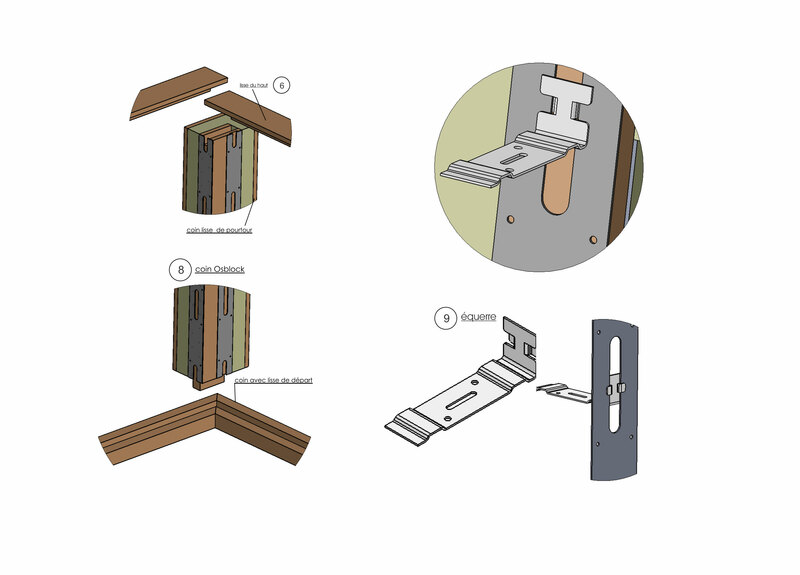 The OSBLOCK (8) are assembled in the corners by an ingenious system of brackets (9) and hinges which eliminates the thermal bridges and facilitates the assembly of the walls. OSBLOCK is lightweight and easily transportable by 2 people. You will not need machinery such as cranes or forklifts on your job site. The OSBLOCK are fixed together using an ingenious and unique system of polymer locks. Just rotate them 1/4 turn so that the building modules are easily locked together. 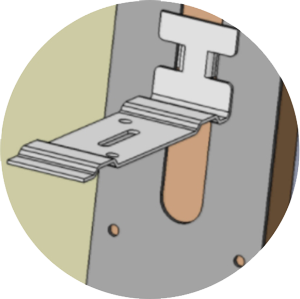 Steel brackets are used to hold the walls at prefabricated corners. 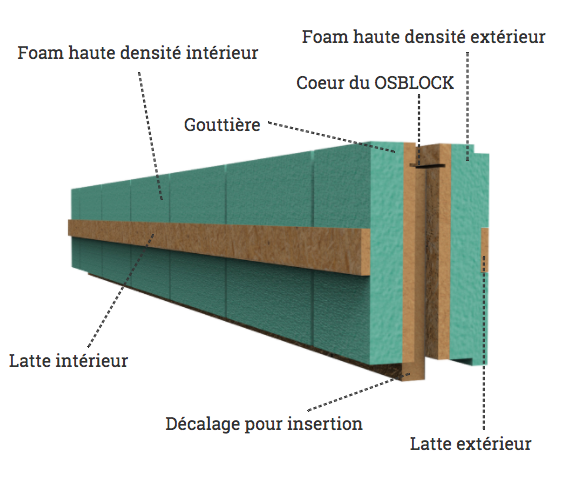 The two layers of polystyrene foam make OSBLOCK a material with high insulating and acoustic properties. The tests show that the OSBLOCK walls have an insulating factor equivalent to R32 and the total absence of thermal bridges. Working with OSBLOCK requires less supervision and offers guaranteed quality and construction strength. On site, some "day laborers" will easily build the walls in one day. OSBLOCK building modules are 100% usable. You will no longer pay for the spaces provided for doors and windows. It is easy and quick to build with the help of OSBLOCK, no need to be an expert. You will raise your walls with professional build quality without any specialized tools. 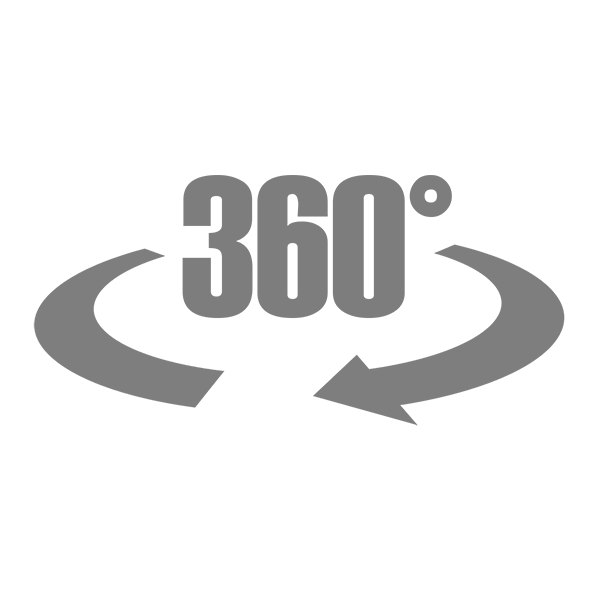 OSBLOCK has a structuring capacity on all its surface. The beams can thus be fixed with stirrups or simply deposited on the blocks. With OSBLOCK building blocks, you just have to insert the OSBLOCK corners on the starting beam and level them for a perfectly straight result everywhere. 1.1 Extend a line around the floor and apply urethane. 1.2 Install the starter bar and secure with two 3 ½ inch screws every 24 inches or so. 2.1 Apply urethane to the corner of the rail. 2.2 Insert the corner end of the corner into the corner of the starting rail. 2.3 Secure the corner to the starting rail with 3 ½ "screws. 2.4 Level the corner and hold it with two temporary furs. 3.1 Cut the OSBLOCK to the desired length and at right angles so that the end of the Osblock to be attached to the corner is without a male or female tip. 3.2 Insert the plastic wall latches under the OSBLOCKs. 3.3 Apply urethane to the starting rail. 4.1 It is best to leave at least 6 inches between the joints of the OSBLOCK. 4.2 Apply urethane to the female part of the OSBLOCK and insert the top block. 4.3 Insert the 14 inch ratchet wrench extension into the holes provided and rotate the polymer lock 1/4 turn using the ratchet wrench. 5.1 When opening windows, use the top rail as the bottom of the window. 5.2 Apply urethane to the female part and secure the OSBLOCK with 3 ½ inch screws every 24 inches. 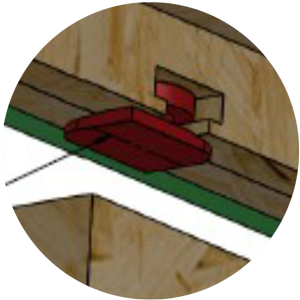 6.1 The end plate will be used as support for your roof trusses or joists. 6.2 Apply the urethane and insert the end plate. 6.3 Secure the rail with 3 ½ "screws. 7.1 Support the floor joists on the end rail above the first floor wall. 7.2 Install the floor of the second floor. 7.3 Repeat all steps of wall mounting. 8.1 Inject urethane and place insulation around the bottom rail (inside and outside). 8.2 Inject the urethane into the corners (inside and outside). 8.3 If necessary, place an air baffle and vertical furs on the outside wall (not supplied). OSBLOCK, a revolution in the field of housing. 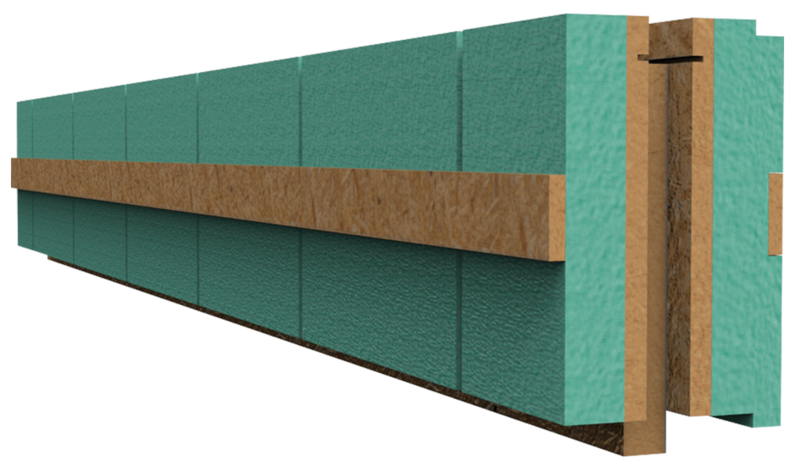 An innovative and advantageous concept to facilitate the construction of insulated walls.